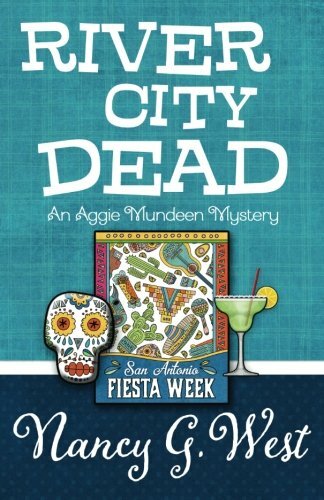 “River City Dead” by Nancy G. West begins when a body is discovered in a penthouse suite reserved for Aggie Mundeen and her boyfriend Sam Vanderhoven during Fiesta Week in San Antonio, Texas. Aggie is extremely disappointed because she and Sam were planning on taking their relationship a step further by sharing this room together. Aggie also knows the victim because she is related to a good friend of hers. Aggie is determined to find out who the killer is. Sam, being a SAPD detective, puts aside thoughts of romance, so that he can focus on the case. He also has to keep an eye on Aggie because he knows she will try to throw herself into the investigation and the outcome for her could be fatal. In spite of this, Aggie throws herself into the investigation. She befriends a group of women called the Fabulous Femmes, who are planning a dance performance as part of the local festivities on the river. Aggie makes sure to be a part of the performance. She also riles a few of the locals by asking a lot of unwelcome questions. In the end, she gets her answers. “River City Dead” is a lively mystery with likeable characters. The heroine, Aggie, is fun to follow, as she fully engages in her role as an unwelcome investigator. Her boyfriend Sam is portrayed as a solid, loyal man. He balances out perfectly with Aggie’s impetuous character. The setting along the San Antonio River Walk is perfect. The author described it so well, I felt like I was there. She also did a great job of keeping me on my toes, as I tried to figure out who the killer was. “River City Dead” is the fourth book in the Aggie Mundeen Mystery series by Nancy G. West. It was the first one for me to read, and I feel that is stands well on its own. I plan on going back and reading the first three because I enjoyed this one so much. I would recommend reading them in order if possible, just so that the story flows better however, it is not necessary. Readers will be delighted to discover this series!